This article is about the Roman emperor Macrinus. For the addressee of many of Pliny the Younger's Epistles, see Minucius Macrinus. For the spider genus, see Macrinus (spider). Macrinus (/məˈkraɪnəs/; Latin: Marcus Opellius Severus Macrinus Augustus;[note 1] c. 165 – June 218) was Roman Emperor from April 217 to 8 June 218. He reigned jointly with his young son Diadumenianus. Macrinus was by origin a Berber from Mauretania Caesariensis. A member of the equestrian class, he became the first emperor who did not hail from the senatorial class and was the first emperor from Mauretania. Before becoming emperor, Macrinus served under Emperor Caracalla as a praetorian prefect and dealt with Rome's civil affairs. He later conspired against Caracalla and had him murdered in a bid to protect his own life, succeeding him as emperor. Macrinus was proclaimed emperor of Rome by 11 April 217 while in the eastern provinces of the empire and was subsequently confirmed as such by the Senate; however, for the duration of his reign, he never had the opportunity to return to Rome. His predecessor's policies had left Rome's coffers empty and the empire at war with several kingdoms, including Parthia, Armenia and Dacia. As emperor, Macrinus first attempted to enact reform to bring economic and diplomatic stability to Rome. While Macrinus' diplomatic actions brought about peace with each of the individual kingdoms, the additional monetary costs and subsequent fiscal reforms generated unrest in the Roman military. 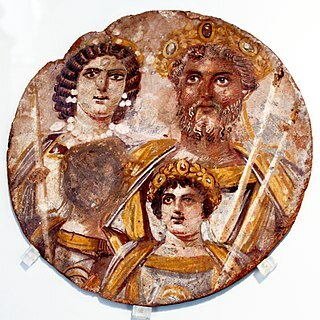 Caracalla's aunt Julia Maesa took advantage of the unrest and instigated a rebellion to have her fourteen-year-old grandson, Elagabalus, recognized as emperor. Macrinus was overthrown at the Battle of Antioch on 8 June 218 and Elagabalus proclaimed himself emperor with support from the rebelling Roman legions. Macrinus fled the battlefield and tried to reach Rome but was captured in Chalcedon and later executed in Cappadocia. He sent his son to the care of Artabanus V of Parthia, but Diadumenianus was also captured before he could reach his destination and executed. After Macrinus' death, the Senate declared him and his son enemies of Rome and had their names struck from the records and their images destroyed. Macrinus was born in Caesarea Mauretaniae (modern Cherchell, Algeria) in the Roman province of Mauretania to an equestrian family of Berber origins. He received an education which allowed him to ascend to the Roman political class. Over the years, he earned a reputation as a skilled lawyer; and, under Emperor Septimius Severus, he became an important bureaucrat. Severus' successor Caracalla later appointed him a prefect of the Praetorian Guard. While Macrinus probably enjoyed the trust of Emperor Caracalla, this may have changed when, according to tradition, it was prophesied that he would depose and succeed the emperor. Macrinus, fearing for his safety, resolved to have Caracalla murdered before he was condemned. In the spring of 217, Caracalla was in the eastern provinces preparing a campaign against the Parthian Empire. Macrinus was among his staff, as were other members of the Praetorian Guard. In April, Caracalla went to visit a temple of Luna near the site of the battle of Carrhae and was accompanied only by his personal guard, which included Macrinus. On April 8, while traveling to the temple, Caracalla was stabbed to death by Justin Martialis, a soldier whom Macrinus had recruited to commit the murder. In the aftermath, Martialis was killed by one of Caracalla's men. For two or three days, Rome remained without an emperor. By April 11, Macrinus had proclaimed himself emperor and assumed all of the imperial titles and powers, without waiting for the Senate. The army backed his claim as emperor and the Senate, so far away, was powerless to intervene. Macrinus never returned to Rome as emperor and remained based in Antioch for the duration of his reign. Macrinus was the first emperor to hail from the equestrian class, rather than the senatorial and also the first emperor of Mauretanian descent. He adopted the name of Severus, in honor of the Severan dynasty, and conferred the imperial title of Augusta to his wife Nonia Celsa[note 2] and the title of Caesar and name of Antoninus to his son Diadumenianus in honor of the Antonine dynasty, thus making him second in command. At the time of Diadumenian's accession he was eight years old. Despite his equestrian background, Macrinus was accepted by the Senate for two reasons: for the removal of Caracalla, and for having received the loyalty of the army. The senators were less concerned by Macrinus' Mauretanian ancestry than by his equestrian social background and scrutinized his actions as emperor. Their opinion of him was reduced by his decisions to appoint men to high offices who were of similarly undistinguished background. Only the Senate had the constitutional power to choose the emperor from among the senators and Macrinus, not being a senator and having become emperor through force rather than through traditional means, was looked down upon. Macrinus had several issues that he needed to deal with at the time of his accession, which had been left behind by his predecessor. As Caracalla had a tendency towards military belligerence, rather than diplomacy, this left several conflicts for Macrinus to resolve. Additionally, Caracalla had been a profligate spender of Rome's income. Most of the money was spent on the army; he had greatly increased their pay from 2,000 sesterces to 3,000 sesterces per year. The increased expenditures forced Caracalla to strip bare whatever sources of income he had to supply the difference. This shortfall left Rome in a dire fiscal situation that Macrinus needed to address. Macrinus was at first occupied by the threat of the Parthians, with whom Rome had been at war since the reign of Caracalla. Macrinus settled a peace deal with the Parthians, after fighting an indecisive battle at Nisibis in 217. In return for peace, Macrinus was forced to pay a large indemnity to the Parthian ruler Artabanus V. Rome was at the time also under threat from Dacia and Armenia, so any deal with Parthia would likely have been beneficial to Rome. Next, Macrinus turned his attention to Armenia. In 216, Caracalla had imprisoned Khosrov I of Armenia and his family after Khosrov had agreed to meet with Caracalla at a conference to discuss some issue between himself and his sons. Caracalla instead installed a new Roman governor to rule over Armenia. These actions angered the Armenian peoples and they soon rebelled against Rome. Macrinus settled a peace treaty with them by returning the crown and loot to Khosrov's son and successor Tiridates II and releasing his mother from prison, and by restoring Armenia to its status as a client kingdom of Rome. Macrinus made peace with the Dacians by releasing hostages, though this was likely not handled by himself but by Marcius Agrippa. In matters of foreign policy, Macrinus showed a tendency towards settling disputes through diplomacy and a reluctance to engage in military conflict, though this may have been due more to the lack of resources and manpower than to his own personal preference. Macrinus began to overturn Caracalla's fiscal policies and moved closer towards those that had been set forth by Septimius Severus. One such policy change involved the pay of Roman legionaries. The soldiers that were already enlisted during Caracalla's reign enjoyed exorbitant payments which were impossible for Macrinus to reduce without risking a potential rebellion. Instead, Macrinus allowed the enlisted soldiers to retain their higher payments, but he reduced the pay of new recruits to the level which had been set by Severus. Macrinus revalued the Roman currency, increasing the silver purity and weight of the denarius from 50.78 percent and 1.66 grams at the end of Caracalla's reign to 57.85 percent and 1.82 grams from Fall 217 to the end of his reign, so that it mirrored Severus' fiscal policy for the period 197–209 A.D. Macrinus' goal with these policies might have been to return Rome to the relative economic stability that had been enjoyed under Severus' reign, though it came with a cost. The fiscal changes that Macrinus enacted might have been tenable had it not been for the military. By this time, the strength of the military was too great and by enacting his reforms he angered the veteran soldiers, who viewed his actions in reducing the pay of new recruits as a foreshadowing of eventual reductions in their own privileges and pay. This significantly reduced Macrinus' popularity with the legions that had declared him emperor. Caracalla's mother Julia Domna was initially left in peace when Macrinus became emperor. This changed when Macrinus discovered that she was conspiring against him and had her placed under house arrest in Antioch. By this time Julia Domna was suffering from an advanced stage of breast cancer and soon died in Antioch, possibly by starving herself. Afterwards, Macrinus sent Domna's sister Julia Maesa and her children back to Emesa in Syria, from where Maesa set in motion her plans to have Macrinus overthrown. Macrinus remained in Antioch instead of going to Rome upon being declared emperor, a step which furthered his unpopularity in Rome and contributed to his eventual downfall. An aureus of Macrinus. Its elaborate symbolism celebrates the liberalitas ("prodigality") of Macrinus and his son Diadumenianus. Inscription: IMP. C. M. OPEL. SEV. MACRINVS AVG. / LIBERALITAS AVG. Julia Maesa had retired to her home town of Emesa with an immense fortune, which she had accrued over the course of twenty years. She took her children, Julia Soaemias and Julia Mamaea, and grandchildren, including Elagabalus, with her to Emesa. Elagabalus, aged 14, was the chief priest of the Phoenician sun-deity Elagabalus (or El-Gabal) in Emesa. Soldiers from Legio III Gallica (Gallic Third Legion), that had been stationed at the nearby camp of Raphanea, often visited Emesa and went to see Elagabalus perform his priestly rituals and duties while there. Julia Maesa took advantage of this, to suggest to the soldiers that Elagabalus was indeed the illegitimate son of Caracalla. On May 16, Elagabalus was proclaimed emperor by the Legio III Gallica at its camp at Raphanea. Upon Elagabalus' revolt, Macrinus travelled to Apamea and conferred the title of Augustus onto his son, Diadumenianus, and made him co-emperor. Macrinus realised that his life was in danger but struggled to decide upon a course of action and remained at Antioch. He sent a force of cavalry commanded by Ulpinus Julianus to regain control of the rebels, but they failed and Ulpinus died in the attempt. This failure further strengthened Elagabalus' army. Soon after, a force under Elagabalus' tutor Gannys marched on Antioch and engaged Macrinus' army on 8 June 218 near the village of Immae, located approximately 24 miles from Antioch. At some point during the ensuing Battle of Antioch, Macrinus deserted the field and returned to Antioch. Macrinus was then forced to flee from Antioch as fighting erupted in the city as well. Elagabalus himself subsequently entered Antioch as the new ruler of the Roman Empire. Macrinus fled for Rome; he traveled as far as Chalcedon before being recognized and captured. His son and co-emperor Diadumenianus, sent to the care of Artabanus V of Parthia, was himself captured in transit at Zeugma and killed in June of 218. Diadumenianus' reign lasted a total of 14 months, and he was about 10 years old when he died. Macrinus, upon learning of his son's death, tried to escape captivity, but he injured himself in the unsuccessful attempt and was afterward executed in Cappadocia; his head was sent to Elagabalus. Much like Macrinus, Diadumenianus' head was also cut off and sent to Elagabalus as a trophy. Macrinus and his son Diadumenianus were declared hostes, enemies of the state, by the Senate immediately after news had arrived of their deaths and as part of an official declaration of support for the usurper Elagabalus, who was recognized in the Senate as the new Emperor. The declaration of hostes led to two actions being taken against the images of the former Emperors. First, their portraits were destroyed and their names were stricken from inscriptions and papyri. The second action, taken by the Roman soldiers who had rebelled against Macrinus in favour of Elagabalus, was to destroy all of the works and possessions of Macrinus. The damnatio memoriae against Macrinus is among the earliest of such sanctions enacted by the Senate. Many of the marble busts of Macrinus that exist were defaced and mutilated as a response to the damnatio memoriae and many of the coins depicting Macrinus and Diadumenianus were also destroyed. These actions against Macrinus are evidence of his unpopularity in Rome. ^ Naylor, Phillip (2015-01-15). North Africa, Revised Edition: A History from Antiquity to the Present. University of Texas Press. ISBN 978-0-292-76190-2. ^ a b c d Gibbon, Edward (1776). The History of the Decline and Fall of the Roman Empire, Volume 1. p. 162. ^ Mennen, Inge (2011). Impact of Empire, Volume 12: Power and Status in the Roman Empire, AD 193–284. Brill Academic Publishers. p. 15. OCLC 859895124. ^ a b c d e Goldsworthy, Adrian (2009). How Rome Fell. Yale University Press. p. 75. ISBN 978-0-300-16426-8. ^ a b c d Goldsworthy, Adrian (2009). How Rome Fell. Yale University Press. p. 74. ISBN 978-0-300-16426-8. ^ Mennen, Inge (2011). Impact of Empire, Volume 12: Power and Status in the Roman Empire, AD 193–284. Brill Academic Publishers. p. 22. OCLC 859895124. ^ a b Gibbon, Edward (1776). The History of the Decline and Fall of the Roman Empire. p. 163. ^ Ando, Clifford (2012). Imperial Rome AD 193 to 284: The Critical Century. Edinburgh University Press. p. 63. ISBN 0-7486-5534-4. ^ a b c Gibbon, Edward (1776). The History of the Decline and Fall of the Roman Empire. p. 164. ^ Varner, Eric (2004). Mutilation and transformation: damnatio memoriae and Roman imperial portraiture. Brill Academic. p. 185. ISBN 90-04-13577-4. ^ a b c d e f Dunstan, William, E. (2010). Ancient Rome. Rowman and Littleman Publishers. p. 407. ISBN 978-0-7425-6832-7. ^ Scott, Andrew (2008). Change and Discontinuity Within the Severan Dynasty: The Case of Macrinus. Rutgers. p. 190. ISBN 0-549-89041-6. ^ Mennen, Inge (2011). Impact of Empire, Volume 12: Power and Status in the Roman Empire, AD 193–284. Brill Academic Publishers. p. 26. OCLC 859895124. ^ Crevier, Jean Baptiste Louis (1814). The History of the Roman Emperors From Augustus to Constantine, Volume 8. F. C. & J. Rivington. p. 238. ^ a b Varner, Eric (2004). Mutilation and transformation: damnatio memoriae and Roman imperial portraiture. Brill Academic. pp. 184–188. ISBN 90-04-13577-4. ^ a b Bunson, Matthew (2014). Encyclopedia of the Roman Empire. Infobase Publishing. p. 173. ISBN 1-4381-1027-8. ^ a b c d Vagi, David (2000). Coinage and History of the Roman Empire, C. 82 B.C. – A.D. 480: History. Taylor & Francis. pp. 289–290. ISBN 1-57958-316-4. ^ a b Goldsworthy, Adrian (2009). How Rome Fell. Yale University Press. pp. 76–77. ISBN 978-0-300-16426-8. ^ a b Scott, Andrew (2008). Change and Discontinuity Within the Severan Dynasty: The Case of Macrinus. Rutgers. p. 118. ISBN 0-549-89041-6. ^ a b Scott, Andrew (2008). Change and Discontinuity Within the Severan Dynasty: The Case of Macrinus. Rutgers. pp. 118–119. ISBN 0-549-89041-6. ^ Dunstan, William, E. (2011). Ancient Rome. Lanham: Rowman and Littlefield. p. 406. ISBN 978-0-7425-6832-7. ^ Boatwright, Mary Taliaferro; Gargola, Daniel J; Talbert, Richard J. A. (2004). The Romans, from village to empire. Oxford University Press. p. 413. ISBN 0-19-511875-8. ^ a b Scott, Andrew (2008). Change and Discontinuity Within the Severan Dynasty: The Case of Macrinus. Rutgers. p. 126. ISBN 0-549-89041-6. ^ Scott, Andrew (2008). Change and Discontinuity Within the Severan Dynasty: The Case of Macrinus. Rutgers. p. 76. ISBN 0-549-89041-6. ^ Goldsworthy, Adrian (2009). How Rome Fell. Yale University Press. p. 88. ISBN 978-0-300-16426-8. ^ Scott, Andrew (2008). Change and Discontinuity Within the Severan Dynasty: The Case of Macrinus. Rutgers. p. 119. ISBN 0-549-89041-6. ^ Scott, Andrew (2008). Change and Discontinuity Within the Severan Dynasty: The Case of Macrinus. Rutgers. p. 111. ISBN 0-549-89041-6. ^ Scott, Andrew (2008). Change and Discontinuity Within the Severan Dynasty: The Case of Macrinus. Rutgers. p. 113. ISBN 0-549-89041-6. ^ Payaslian, S (2008). The History of Armenia: From the Origins to the Present. Springer. p. 32. ISBN 0-230-60858-2. ^ Scott, Andrew (2008). Change and Discontinuity Within the Severan Dynasty: The Case of Macrinus. Rutgers. p. 270-271. ISBN 0-549-89041-6. ^ Scott, Andrew (2008). Change and Discontinuity Within the Severan Dynasty: The Case of Macrinus. Rutgers. pp. 114–115. ISBN 0-549-89041-6. ^ Gibbon, Edward (1776). The History of the Decline and Fall of the Roman Emperor. pp. 165–166. ^ Scott, Andrew (2008). Change and Discontinuity Within the Severan Dynasty: The Case of Macrinus. Rutgers. pp. 127–128. ISBN 0-549-89041-6. ^ Scott, Andrew (2008). Change and Discontinuity Within the Severan Dynasty: The Case of Macrinus. Rutgers. pp. 130–131. ISBN 0-549-89041-6. ^ a b Scott, Andrew (2008). Change and Discontinuity Within the Severan Dynasty: The Case of Macrinus. Rutgers. pp. 134–135. ISBN 0-549-89041-6. ^ Gibbon, Edward (1776). The History of the Decline and Fall of the Roman Empire. p. 166. ^ a b Goldsworthy, Adrian (2009). How Rome Fell. Yale University Press. p. 176. ISBN 978-0-300-16426-8. ^ a b c d Glanville, Downey (1961). History of Antioch in Syria: From Seleucus to the Arab Conquest. Literary Licensing. pp. 248–250. ISBN 1-258-48665-2. ^ Vagi, David (2000). Coinage and History of the Roman Empire, C. 82 B.C. – A.D. 480: History. Taylor & Francis. pp. 295–296. ISBN 1-57958-316-4. ^ Goldsworthy, Adrian (2009). How Rome Fell. Yale University Press. p. 77. ISBN 978-0-300-16426-8. ^ Goldsworthy, Adrian (2009). How Rome Fell. Yale University Press. p. 78. ISBN 978-0-300-16426-8. ^ a b Gibbon, Edward (1776). The History of the Decline and Fall of the Roman Empire. p. 169. ^ Mennen, Inge (2011). Impact of Empire, Volume 12: Power and Status in the Roman Empire, AD 193–284. Brill Academic Publishers. p. 164. OCLC 859895124. ^ Icks, Martijn (2011). The Crimes of Elagabalus: The Life and Legacy of Rome's Decadent Boy Emperor. I. B. Tauris. p. 14. ISBN 1-84885-362-9. ^ a b c d Crevier, Jean Baptiste Louis (1814). The History of the Roman Emperors from Augustus to Constantine, Volume 8. F. C. & J. Rivington. pp. 236–237. Boatwright, Mary Taliaferro; Gargola, Daniel J; Talbert, Richard J. A. (2004). The Romans, from village to empire. Oxford University Press. ISBN 0-19-511875-8. Bunson, Matthew (2014). Encyclopedia of the Roman Empire. Infobase Publishing. ISBN 1-4381-1027-8. Crevier, Jean Baptiste Louis (1814). The History of the Roman Emperors From Augustus to Constantine, Volume 8. F. C. & J. Rivington. Downey, Glanville. (1961). History of Antioch in Syria: From Seleucus to the Arab Conquest. Literary Licensing. ISBN 1-258-48665-2. Dunstan, William (2011). [NVhttps://books.google.co.uk/books?id=xkOhwFzz1AkC Ancient Rome]. Lanham: Rowman & Littlefield. ISBN 978-0-7425-6832-7. Goldsworthy, Adrian (2009). How Rome Fell: Death of a Superpower. New Haven: Yale University Press. ISBN 978-0-300-16426-8. Icks, Martijn (2011). The Crimes of Elegabalus: The Life and Legacy of Rome's Decadent Boy Emperor. I. B. Tauris. ISBN 1-84885-362-9. Mennen, Inge (2011). Power and Status in the Roman Empire, AD 193–284. Impact of Empire. Volume 12. Brill Academic. OCLC 859895124. Naylor, Phillip (2015). North Africa, Revised Edition: A History from Antiquity to the Present. University of Texas Press. ISBN 978-0-292-76190-2. Payaslian, S. (2008). The History of Armenia: From the Origins to the Present. Springer. p. 32. ISBN 0-230-60858-2. Scott, Andrew (2008). Change and Discontinuity Within the Severan Dynasty: The Case of Macrinus. Rutgers. ISBN 0-549-89041-6. Vagi, David (2000). Coinage and History of the Roman Empire, C. 82 B.C. – A.D. 480: History. Taylor & Francis. ISBN 1-57958-316-4. Varner, Eric (2004). Mutilation and transformation: damnatio memoriae and Roman imperial portraiture. Brill Academic. ISBN 90-04-13577-4. Dio, Cassius. (n.d.). Roman History. Herodian of Antioch. (n.d.). History of the Roman Empire. Wikimedia Commons has media related to Macrinus. Severus Alexander was Roman Emperor from 222 to 235 and the last emperor of the Severan dynasty. He succeeded his cousin Elagabalus upon the latter's assassination in 222. His own assassination marked the epoch event for the Crisis of the Third Century—nearly 50 years of civil wars, foreign invasion, and collapse of the monetary economy, though this last part is now disputed. Elagabalus, also known as Heliogabalus, was Roman emperor from 218 to 222. A member of the Severan dynasty, he was Syrian, the second son of Julia Soaemias and Sextus Varius Marcellus. In his early youth he served the god Elagabalus as a priest in Emesa, the hometown of his mother's family. As a private citizen, he was probably named Sextus Varius Avitus Bassianus. Upon becoming emperor he took the name Marcus Aurelius Antoninus Augustus. He was called Elagabalus only after his death. The Severan dynasty was a Roman imperial dynasty, which ruled the Roman Empire between 193 and 235. The dynasty was founded by the general Septimius Severus, who rose to power as the victor of the Civil War of 193–197. Caracalla, formally known as Antoninus, ruled as Roman emperor from 198 to 217 AD. He was a member of the Severan dynasty, the elder son of Septimius Severus and Julia Domna. Co-ruler with his father from 198, he continued to rule with his brother Geta, emperor from 209, after their father's death in 211. He had his brother killed later that year, and reigned afterwards as sole ruler of the Roman Empire. Caracalla's reign featured domestic instability and external invasions by the Germanic peoples. Geta was Roman emperor with his father Septimius Severus and older brother Caracalla from 209, when he was named Augustus like his brother, who had held the title since 198. Severus died in 211, and although he intended for his sons to rule together, they proved incapable of sharing power, culminating with the murder of Geta in December of that year. Julia Domna was a Roman empress of Syrian origin, the second wife of Septimius Severus. She was born in Emesa in the Roman province of Syria, into a family of priests of the deity Elagabalus. As a powerful political figure and member of the imperial family, Julia received titles such as "mother of the army camps". She was famous for her political and philosophical influence. Julia Maesa was a 3rd-century Augusta (empress) of the Roman Empire from Arab origins and a powerful, prominent and influential figure in the empire's politics during the rule of the Severan dynasty. Born in Emesa, Syria, Maesa was the daughter of the high priest of Emesa's Temple of the Sun, and the elder sister of future Roman empress Julia Domna. 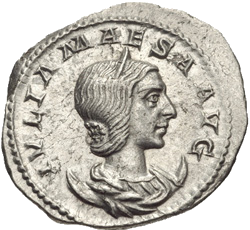 Julia Soaemias Bassiana was a Syrian noblewoman and the mother of Roman emperor Elagabalus who ruled over the Roman Empire from 218 to 222. She was born and raised in Emesa, Syria and through her mother was related to the Royal family of Emesa, and through marriage, to the Severan dynasty of Ancient Rome. Diadumenian, was briefly Roman Emperor, in 218. He was born to Macrinus, the future emperor, and Nonia Celsa, whose name may be fictitious, on 14 September 208. He was elevated to Caesar in May 217, and after Elagabalus revolted a few days later Diadumenian was elevated to co-emperor. After Macrinus was defeated in the Battle of Antioch, on 8 June 218, Diadumenian was sent to the court of Artabanus V to ensure his safety; however he was captured and executed along the way, in late June. The Battle of Antioch was fought between the Roman armies of the Emperor Macrinus and his rival Elagabalus, whose troops were commanded by General Gannys, probably a short distance from Antioch. Gannys' victory over Macrinus led to the downfall of the emperor and his replacement by Elagabalus. Theoclia was a Syrian Roman noblewoman.